How will you feel when you can quit that 9 to 5 job? Are you jumping out of bed & excited to go to your job everyday because you absolutely love what you do? Is your career allowing you to fulfill your passions and make a difference in the world? Are you earning a fabulous income that gives you the freedom to enjoy the lifestyle of your dreams? Perhaps you’re reading this on your lunch hour and hoping your boss doesn’t see you right now. Having a family makes you feel guilty just thinking about leaving the cushy corporate lifestyle but you know staying there is just making you more miserable, bored and dissatisfied. Maybe you’re at a point where you’ve completely stopped caring about your job. You make decent money with benefits but you’re not happy. Sitting at your desk, you’re tired and want to leave. You could even be building your business and working on it everyday but it seems too slow. You want to plan your exit strategy. I know, because I was in your shoes just a few short years ago . . . I was a rocket scientist and was successful within my company, but the job didn’t light me up inside. I was feeling confused since I’d worked so hard to get to where I was and yet a feeling of dissatisfaction was always within me. I was lost as I always dreamed of various business ideas that I wanted to pursue, but I had no idea how to escape the allure of a secure, 6-figure corporate job. I was scared to take the leap because I didn’t know where to start, what to do or how to actually do it in a way that wouldn’t sacrifice the support I provided to my family. All I really wanted to do was help people and leave my mark on the world . . . but the thought of not having a secure income or benefits kept me paralyzed in the corporate web of security. I almost gave it all up. My dreams, my hopes, my desires. I was this close to staying in the matrix of the GOOD life but not the GREAT life I knew I wanted and deserved. I DISCOVERED A WAY TO BUILD A BUSINESS FROM SCRATCH THAT DIDN’T PUT MY FINANCIAL SECURITY AT RISK . . . Suddenly, my weekdays became exciting again. My life was full of hope and I could finally start to see how I could have a life where I could do whatever I wanted, whenever I wanted. Freedom! How would you like to design a life where you have complete time and financial freedom to do what you want, when you want? Fast-forward to today: I’ve created not just one but two businesses that have impacted thousands of women around the world to live their best lives and create businesses they love. I’m able to take my kids to the doctor or the park in the middle of the day and take vacations without asking for permission. AND I wake up excited about my online business. I’m not talking about selling lotions or potions to my family and friends or any other “get rich quick” schemes some people association with “online business”. I’m talking about creating a service-based business entirely online that allows you to use your natural abilities and passions (and even skills learned in your corporate job) to help people who need what you have to offer. Within just a few short weeks, I had created my business and money started flowing. Overcoming the lack of structure in the entrepreneurial world was one of my biggest breakthroughs that helped me get to where I am today. After years in academia and corporate, I still craved that structure when starting my own business. My PhD in engineering has given me the foundation for being able to teach very complicated tasks in a very easy to understand manner through the use of step-by-step systems. Not only have I been able to use this skill to present at NASA, the Japan Aerospace Exploration Agency, the U.S. Air Force and others, but I’ve also been able to help my clients replace their corporate income within just a few months of working with me without being overwhelmed in the process. In fact, people tell me all the time how they’ve enjoyed the experience of working with me . . . and have been amazed at how I make it so easy and enjoyable to start a business. I’ve been mentored and trained by some of the best coaches, strategists and experts in the online marketing industry. 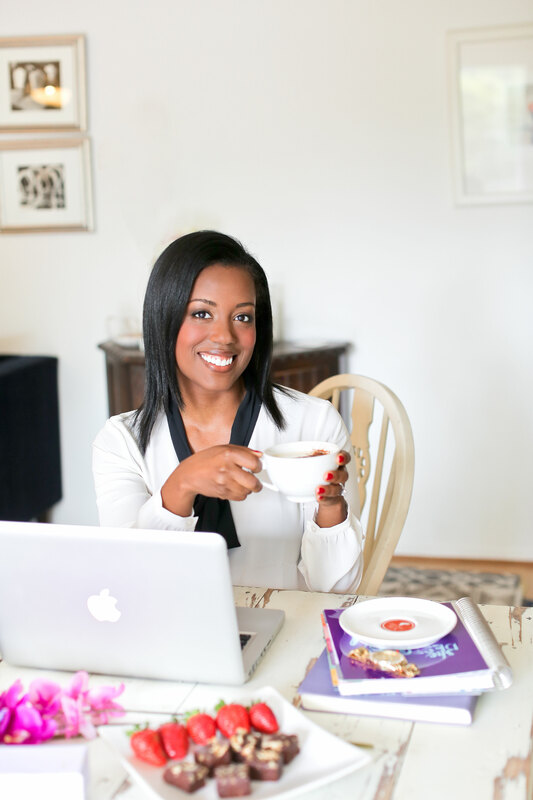 My businesses and I have been featured in Working Mother, Black Enterprise, HuffPost Live and in internal publications for Fortune 500 companies. My belief is everyone in unique and your business should reflect that. You aren’t cookie-cutter and your business shouldn’t be either. In fact, I’ve coached women in over 12 different industries including life and business coaching, makeup artistry, photography, nutrition and more. During the last few years I’ve been in business, I’ve reached over 250,000 women worldwide and I can show you how to do the same. After all, you don’t want to keep all of your awesomeness to yourself right? Making more money by helping people creates a win-win for everyone! I want every woman to discover her unique combination of what she loves to do, what she’s skilled at doing, and what others will pay for so she can be confident and empowered in creating a business that supports her desired lifestyle. No more dreading Monday mornings, squeezing your life into the weekend, or counting down the hours until 5 pm so you can leave work . . .
Building your online business is about uncovering your marketable skills and passions, turning those into a service-based offering, connecting with others who need what you have to offer, and exchanging massive value for payment. This allows you to create a business from a place of integrity and fulfillment and is a true representation of you. I designed this program to walk you step-by-step through the process of building your online business, which is unlike anything you’ll find from most other coaches or online courses. Here’s the breakdown of how we’re going to build your online service-based business with ease . . .
How to set up the technical side of business from email providers, webinars, course creation and more. PLUS YOU’LL GET THESE AMAZING BONUSES . . . BONUS NUMBER 1: Access to my technical training vault. Over 10 hours of behind-the-scenes, step-by-step training on everything from creating Facebook Ads that convert, creating amazing images to use in your marketing, setting up webpages, creating sales funnels that make money, running webinars for free, and much more! It’s like getting a course and a coach in one so that you won’t waste time or money getting bogged down with the techy side of business. BONUS NUMBER 2: Lifetime access to all of your coaching materials. You’ll get recordings of all training sessions so you can be fully present during your session, not scrambling to take notes. Any material that we create during your coaching sessions will be yours forever so that you can continue to benefit from your personalized coaching program for months and years to come. BONUS NUMBER 3: Unlimited e-mail access to me during the duration of the program. Have questions in between sessions? Want me to review some of your work? Need a motivational boost and can’t wait until the next call? Hit me up via e-mail as much as you’d like so you have complete accountability and support. BONUS NUMBER 4: Two free money mindset books & personalized money mindset plan. The mentality required to be successful in entrepreneurship is completely different than how we were trained to be successful in corporate. Don’t worry, with my recommended reading list provided for you and my personalized money mindset plan, you’ll attract your dream clients and dream life in record time. BONUS NUMBER 5: My time management and productivity system. Is lack of time one of your biggest hesitations with starting an online business? With my time management and productivity system, you will save hours of time each week so you can build your online empire while still having a life . . . and sleep . . . and fun! You’ll get my Dream Business Jumpstart 3-Hour Private Online Intensive program for free if you sign up for the 90-Day program during our discovery session. I’ve spent over $35,000 learning how to build my online business through several online courses and working with 3 business coaches. 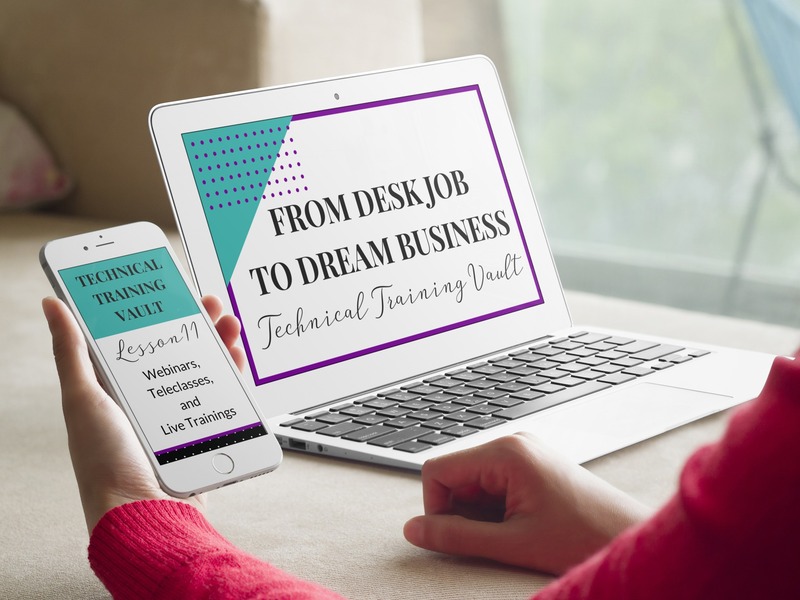 This bonus compiles all of that information, in my easy-to-understand teaching method, and is available to you for $0.00 as a bonus for enrolling in From Desk Job to Dream Business Private Coaching Program. It’s like getting a course and a coach in one! I’ve designed this program so you can get access to all the guidance, information and accountability you need without having to make any other high-ticket investments. With this program, you won’t need to invest thousands in other business courses. You won’t need to juggle competing and conflicting advice from free webinars, blogs and podcasts. And you won’t have to navigate the time-consuming trial and error that goes along with building an online business that really suits you and your lifestyle. If you bought all of this information separately it would cost you $40,000 or more. To get the same results in your business from traditional business school you’d have to pay over $100,000 and that would just lead you into another job. AND YOU CAN GET THE FAST ACTION BONUS TOO! I’ve designed this program so you can get access to all the guidance, information and accountability you need without having to make any other high-ticket investments. With this program, you won’t need to invest tens of thousands in other business courses. You won’t need to juggle competing and conflicting advice from free webinars, blogs and podcasts. And you won’t have to navigate the time-consuming trial and error that goes along with building an online business that really suits you and your lifestyle. The total package for the From Desk Job to Dream Business includes . . .
A total value of over $10,000. According to a study conducted by Intuit Quickbooks, 53% of Americans have considered launching a side business. And 70% of all corporate employees don’t feel fulfilled in their job. Considering that the average American spends 33% of their life working, is it any surprise that a majority are asking themselves if a successful professional life is all there is? YOU HAVE ONE SHOT AT THIS LIFE AND YOU DESERVE TO MAKE A LIVING DOING WHAT YOU LOVE. 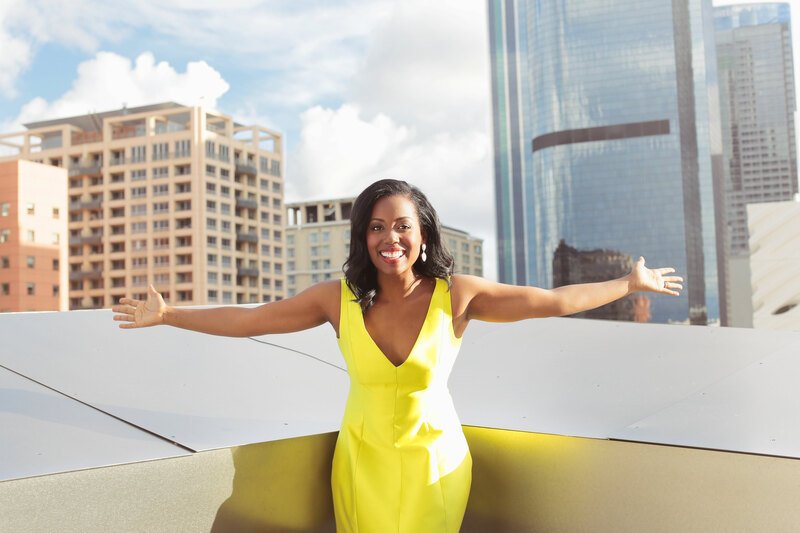 I want to empower and educate you to claim your brilliance, form a business around your skills (yes, you absolutely have marketable skills even if you don’t know what they are yet! ), and share your gifts with the world, and From Desk Job to Dream Business is going to make that possible for you. ARE YOU READY TO MAKE YOUR DREAMS YOUR REALITY? The most important thing people should know about working with Portia is that it does not matter where you are in your business Portia is willing to work with anyone who is willing to put the work in. It is really important when starting out to have a mentor who has done it before you. I think we underestimate the value of having a mentor and it could possibly be the most important thing you need in your business. I would definitely recommend Portia to any newbie online entrepreneur who is trying to figure out how to and where to start with creating offers and services. I am really happy with the coaching session that I had with her!I am clear on who i want to work for and my mission. I know how to position myself and I know what to work on next!!! Portia is very straightforward and filled with strategies!!!! After working with Portia I am more confident in myself and my abilities. I am not afraid of selling myself and putting myself out there AND I was able to quit my 9-5 job half way through her program. I recommend working with Portia to anyone who is thinking of starting an online business and has ideas, but doesn’t have the know how on how to actually execute. Portia not only helps you find your strengths, but she teaches you how to implement proven strategies. Working with Portia has changed my life. From Desk Job to Dream Business will NOT teach you how to become a 7-figure business owner in 90 days nor will it teach you how to create an online business in 2 hours a week so if that’s what you’re looking for, then this coaching program is not for you. However, if you are truly committed to creating a life and business that you love by helping others and sharing your gifts with the world then the From Desk Job to Dream Business 90-Day Coaching Program is exactly what you’ve been looking for. With my guidance, you will create an online business that you’re proud of and that propels you and your clients to achieving your best life. A life by design not by default. And you will make amazing money in the process. This business model is truly win-win, and it’s just a couple of clicks away . . .
Enrollment for From Desk Job to Dream Business is by application only, so apply today . . . When you sign up for this powerful one-to-one coaching program, you get . . . I believe in providing high-level service to each of my clients – answering all questions, guiding you step-by-step, and supporting you in between sessions so registration won’t stay open long because I have a limited number of 1x1 coaching seats. Don’t delay your chance for entrepreneurial freedom any longer. It’s YOUR time. If you following my coaching and take action by applying what you learn in your business right away, I know you will see huge gains and shifts in your business formation and growth. If you complete all of the action items that we create in your individual sessions by the deadlines created and do not see results – I will give you 3 additional months of coaching via e-mail . . . completely free. Why would I do this? It’s simple. If you are the kind of person who just dabbles at ideas but never actually executes any of them, then signing up for this coaching package will not help you. However, if you are ready to really commit to From Desk Job to Dream Business – and put in the time and effort to implement what you learn – then I honestly believe that this program will help you create a business you are proud to call your own. However, if you are ready to really commit to From Desk Job to Dream Business – and put in the time and effort to implement what you learn – then I honestly believe that this program will help you create a business you are proud to call your own. It doesn’t matter if you are a corporate career woman that’s stressed-out, over-worked, struggling to get by, and yearning for the life of your dreams, or if you love your job but want to start a side business to accelerate your financial goals, my 1×1 coaching program is for you! I’ve been looking at other online coaching programs. How is your program different? A lot of coaches will tell you what needs to be done but won’t tell you HOW to do it. As a Type-A, super detailed person, my clients won’t have to guess what comes next or try to fill in the blanks of what to do. I don’t know if I have it in me to make the life changes I’m going to need to make. I’m scared I’ll never be able to live the life of my dreams. First and foremost, we are gonna get you in the right frame of mind. I just ask that you believe in yourself and the process. We’ll kick your fear and limiting beliefs to the curb and get you on the path to the life of your dreams. You can do this! I believe in you and I just ask that you be brave and believe in yourself too! I am really busy and work a day job on top of all my family responsibilities. How much time do I need to commit to this program each week? If you want success, you have to put in the time! Each week you need to set aside at least 45 minutes for our 1:1 coaching call. You’ll also have to set aside time to review the summary notes of our call and to implement any action items I give you after our weekly call. I’m excited to join. How do I pay? You can pay in full or do three monthly payments. Payments will be via Paypal. The pay now buttons are located at the bottom of this page. Are you ready to finally to have a career that you’re fiercely passionate about, spend time with people you love, and wake up excited to start your day? ARE YOU READY TO GO FROM DESK JOB TO DREAM BUSINESS? Click the button below to fill out the application and sign up for a discovery session now. At this point you can continue to dream about starting your own business, wasting your potential behind a desk for 8 hours (or more) a day, and watching others live their best lives on Facebook or you can choose to take action today and get personalized support every step of the way with me so you can have the business and lifestyle you know you’re meant to have. P.S. – My one-to-one private coaching program – From Desk Job to Dream Business is EXCLUSIVELY designed for the professional career woman . . . who is unfulfilled climbing the corporate ladder and desires to build an online service-based business with full, personalized support while leveraging proven systems to condense the timeline in creating time and financial freedom for her life. Please note: Due to your purchase being a coaching package in a business capacity, I do not offer refunds or cancellations. All contracts and purchases are binding, please refer to the purchase and refund policy on my website for additional information. © 2016 From Desk Job to Dream Business by Portia Jackson | Designed by Miesha Jihan Designs | All Rights Reserved.